Chocolate #1: Breyers light chocolate ice cream, and it's as tasty as ever. Chocolate #2: A wonderful chocolate swirl. This isn't some cheap fudge swirl that ruins the whole thing. No no no, this is a nice candy bar quality swirl and I enjoyed every bite. Chocolate #3: Hello? chocolate #3? where did ya go? looking.... looking.... ummm, nope, no where to be seen. What's up with that? The container clearly states that there are chocolate covered Twix cookie pieces in here. Not a -single- piece of Twix I found had chocolate on it, not one! 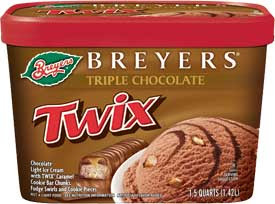 The funny thing about Twix Triple Chocolate is that the Twix is the Achilles heel of this flavor. Not just because it's not covered in chocolate, I can forgive that, there's already plenty of tasty chocolate here. No, the problem is the Twix pieces aren't that good. They taste like really hard balls of graham cracker. I'm sure they would taste more like a Twix if they were bigger, but they are about the size of a... ok, can't think of a good comparsion, but they're not big at all. Guess we'll just have to wait and see if my opinion changes on the second scoop. On Second Scoop: You know, there's something special about this ice cream. I just had my second bowl and again I find myself wanting to refill it. No, it's not perfect, but the way everything comes together it really leaves you wanting more (but not in a bad way). I found myself prepared for the cookie bits this time and I anticipated their flavor mixing with the two chocolates. Hehehehehe, maybe it's like real Twix, you eat one, and then you need the other one. 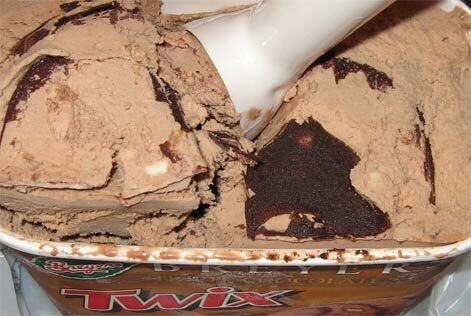 This product has been discontinued, but Mars themselves now make a Twix ice cream. I love Twix! I had no idea Bryers had teamed up with them, I am going to have to get myself a carton. Thanks! Who the heck posted a negative review of this ice cream? ;) This flavor is perfect and one of the best brand-name candy bar ice creams ever created! omg this is the best ice cream ever!